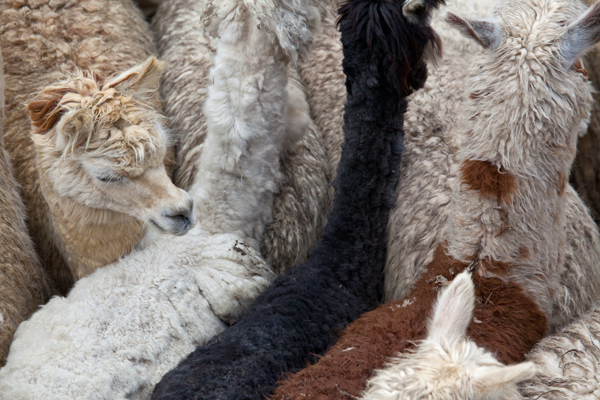 The annual livestock fair in Urcos was so cool that I thought it deserved it’s own post . . . these photos were taken from a bridge, overlooking the market. I think it offers a neat perspective. P.S. From now on, I will be posting Rick’s photos along with mine – the photo credits are in the caption of each image. After visiting the lowland sites supported by Interoceanica SUR, Rick and I scored an invitation to their sites in the Andes. Claudia Yep, the Director of Tourism, invited us to visit last Friday and had everything arranged by Sunday. 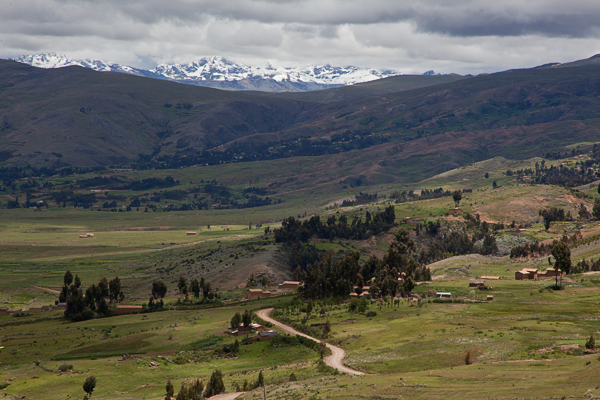 She sent a car to pick us up in Cusco and to take us to iSUR’s house at 3,800 meters on the Interoceanic Highway. Herman and Taco arrived at the hotel right on time and we set off for the highway, with assurances that we could ask to stop for a photo at any time. That is a dangerous offer for two photographers, but it was sincerely meant and we had a nice drive with many stops for birdwatching and photography. One stop of note was in Urcos, the first city along the highway. 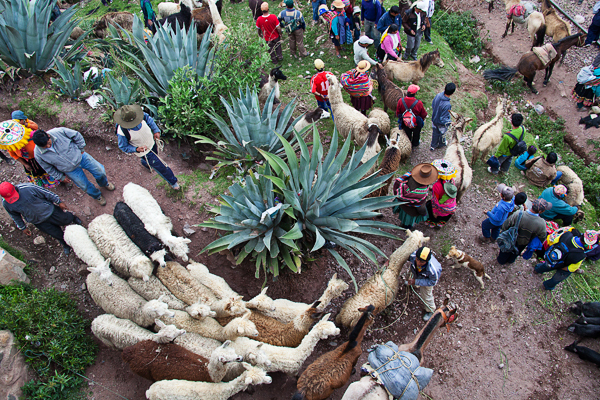 It is famous for it’s beautiful lagoon and we happened to pass through Urcos on the day of its annual livestock fair. 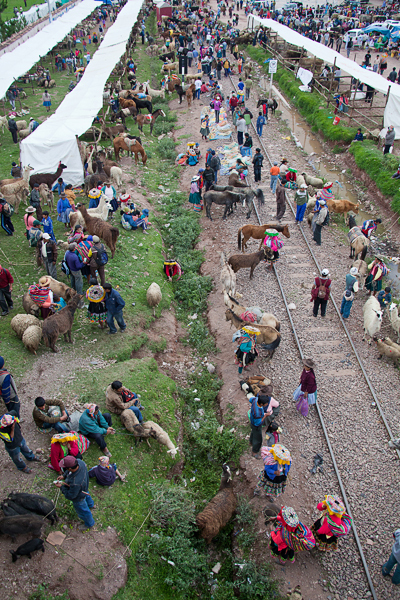 We stopped by a bridge and were able to look down on thousands of people trading their llamas, alpacas, cows, and pigs. 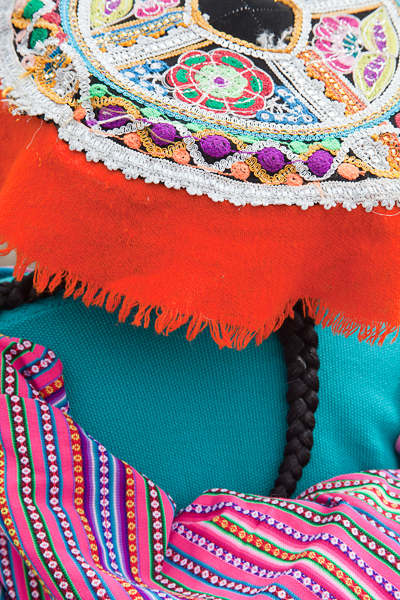 The fair in Urcos draws people from across the Andes and you could see the diversity of visitors from the differences in their dress. It was lovely to see the beautiful hats of the women from above and to take photos with a long lens, unnoticed by the people below. Along this part of the highway, iSUR is working with local communities to create sustainable businesses that will help augment their income and improve the quality of their lives – these efforts simultaneously promote the conservation of nature and culture. We met Claudia at one of iSUR’s projects at 4,300 meters in elevation– it is a restaurant and overlook that has a breathtaking view of the snow-capped Ausungate Mountain. 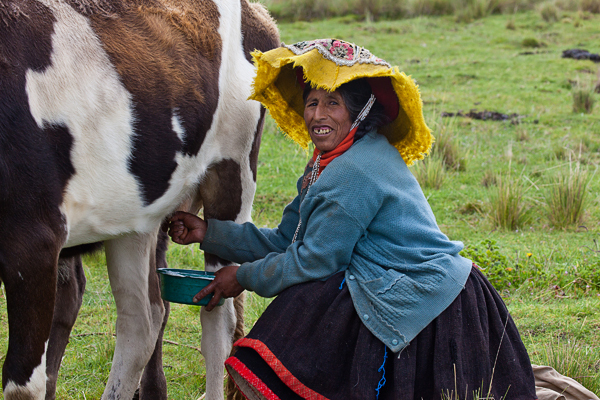 The community of Cuyuni owns and runs the restaurant there and we were greeted with hot coca tea and choclo (a thick-kerneled corn native to the Andes) and cheese. We learned about Cuyuni’s efforts to bring in tourists and their goals for the future. In addition to the restaurant, they have a small store field with work by local artisans. I purchased two baby alpaca scarves that were completely handmade – from shearing the alpaca to spinning the yarn. 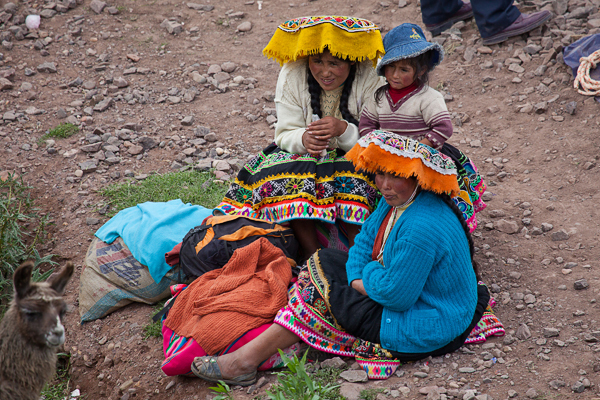 After our visit at the restaurant, we met with the director’s of Cuyuni’s projects and were greeted by beautifully dressed women, hiking up the small hills while spinning their yarn. Two men and two women kindly agreed to be interviewed and we asked them questions about the impact of the highway on their lives. Overall, they are very pleased with the highway. A journey that used to take seven hours now takes 45 minutes and they have better access to healthcare and education. The women also commented on the fact that their clothes are cleaner when they walk on the new paved road. 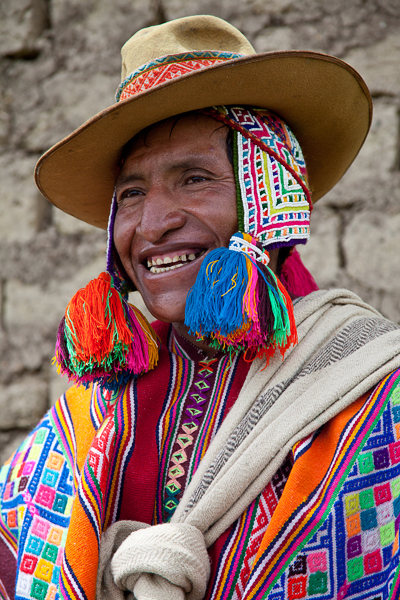 The people all spoke in Quechua, so I worked with Herman to ask the questions. I will be posting some of these videos as soon as I have time to work with a translator. We arrived at iSUR’s worksite just as the sun was setting. They have a nice office and a building with bedrooms. Rick and I each received our own bedroom, replete with space heaters, sinks, and private bathrooms. Both of us were worn out and feeling under the weather because of the altitude. We rested until dinner and then spent some time talking with the staff before heading off to bed. 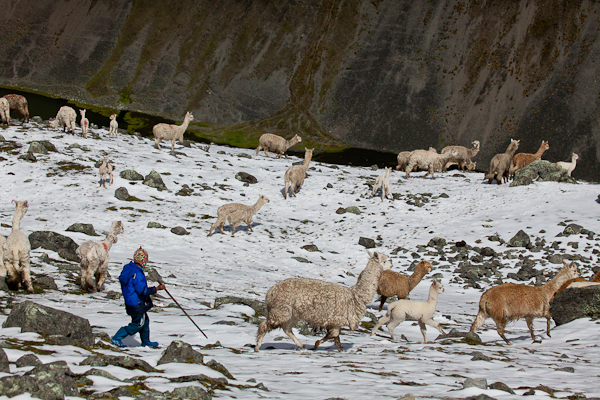 Boy herding alpaca at 4,900m in elevation in the Andes. It’s been a while since I’ve contributed to the blog! Rick arrived on January 4th and we’ve been working in Tambopata National Reserve and Puerto Maldonado (lowland rainforest) until last Sunday. It’s been a busy time and we returned to Cusco for only a night before leaving for the the highest point on the Interoceanic Highway (4,800 meters elevation). We received an invitation from Interoceanica SUR (iSUR) to visit their highland projects and were taken on a 4-day tour of the communities they work with between the cities of Marcapata and Urcos on the highway. We are back in Cusco for a few days and I will be catching up on my posts. For now, here are a few favorite images from my adventure yesterday along the old highway between Cusco and Puerto Maldonado! 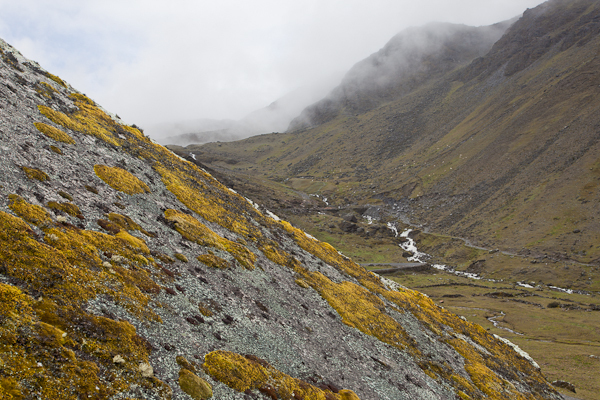 This part of the highway peaks at 4,950 meters and is all gravel and dirt. The trip between Cusco and Puerto Maldonado on this highway used to take up to 15 days depending on the season. The trip takes 10 hours on the new highway. 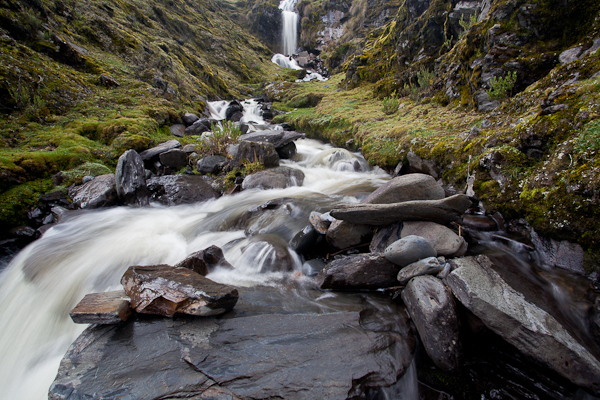 Waterfall at 4,500 meters along the old highway (before the Interoceanica SUR). 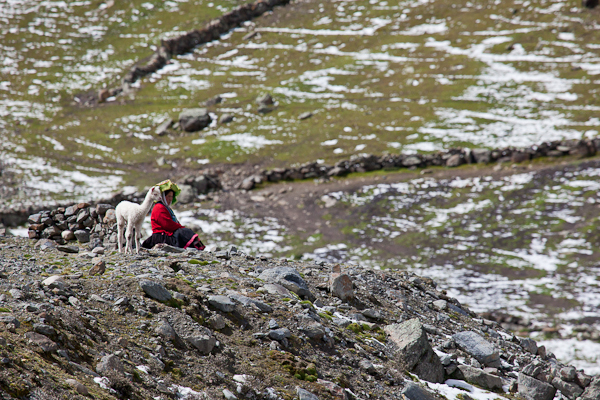 Woman watching her alpacas at 4,700m in elevation along the old highway between Cusco and Puerto Maldonado, Peru. 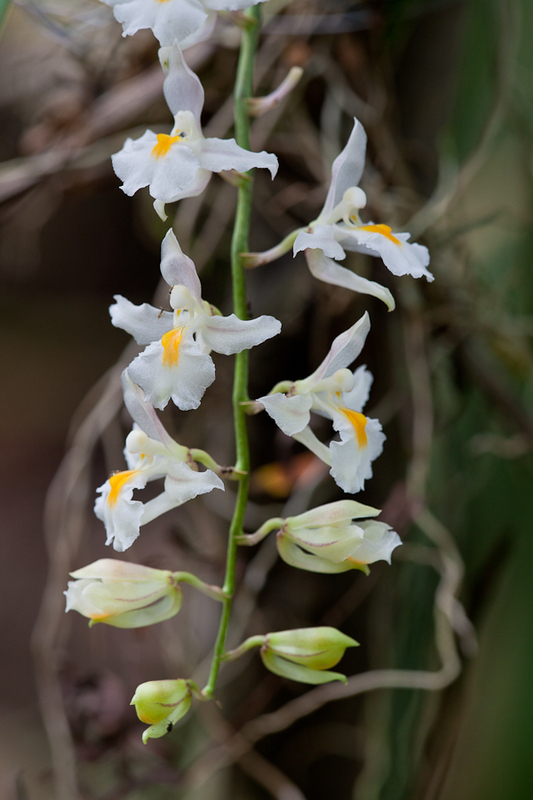 Flowers in the swamp . . .
Got up at 4:00am this morning and Therany and I drove to Herbert’s property to see sunset from his canopy tower. We arrived at 4:40am to the sounds of barking dogs and climbed up the hill to wait for the sky to color. It was too cloudy for much of a sunrise, but the view was beautiful and we spent a peaceful hour birdwatching from the tower. 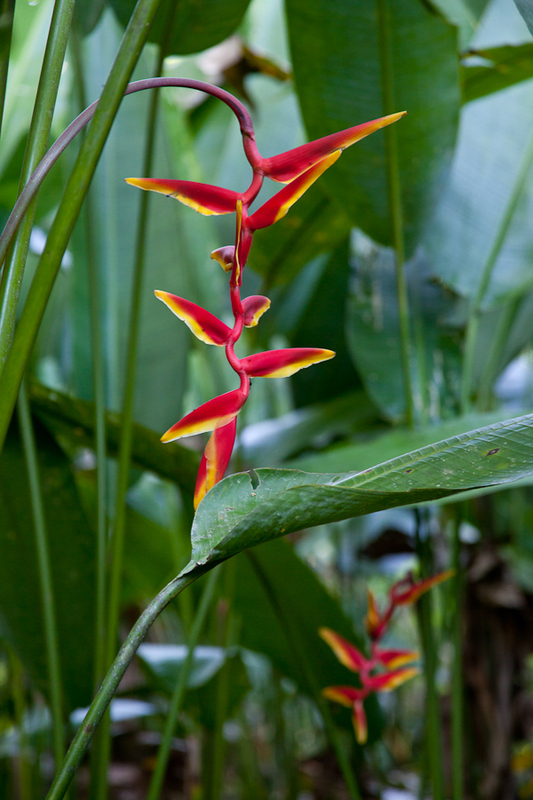 It is incredible that 20 minutes from the city of Puerto Maldonado you can see trogons, motmots, oropendulas, tanagers, woodcreepers, and a myriad of other birds. We saw over 25 species over the course of an hour from a single lookout. After breakfast at Magali’s we made a quick trip into Puerto to fix a flat tire. The problem was a nail and it cost $1.50 to fix it at the shop. Incredible. After that we returned to the corridor to visit Percy at El Parayso. It is an incredible property. He lives on the land with his parents, both of whom have been here since the 1940’s. I spent lunchtime questioning them about the rubber boom and they were full of fascinating anecdotes. Percy’s is one of the oldest families in this region. Percy is trying to create an ecotourism experience based on birdwatching and wildlife viewing. The property is perfect for it. 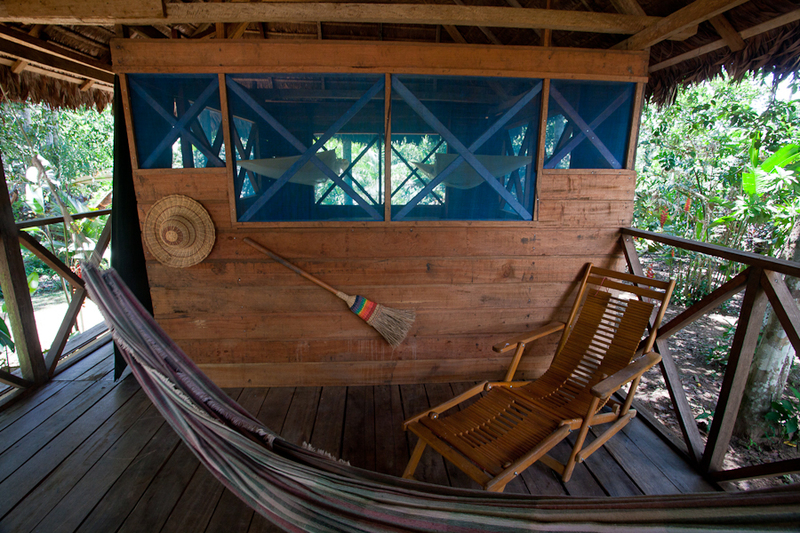 Two rustic cabins are situated on the bank of the Tambopata River. You can look out at the river and feel a nice breeze all day long. He has a trail of over three kilometers that goes into primary forest. The trees are beautiful – he has ceibas and ironwoods that are of a size that is almost impossible to find in this region (they have all been cut down for lumber). We walked through the forest for over four hours and he showed me the swamp where he is planning to build a boardwalk and canopy tower. 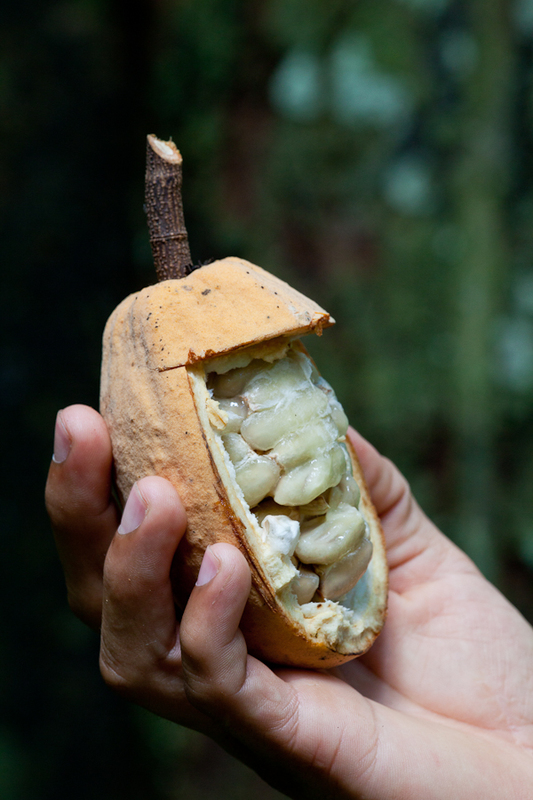 We heard hoatzins, saw hummingbirds, and tasted native cocoa fruits as we made our way through the selva. Talking with Percy, Robert, and Herbert, I am amazed at the passion that they all feel for conserving their land. For them nature is number one. They also believe strongly in the importance of environmental education. I am worried about the disconnect between children and nature in the United States and have often assumed that the situation would be better in a place like Peru. It’s not. These children live 30 minutes from one of the most biodiverse places on the planet and they are just as plugged in to television and iPods. These men and women are trying to change that. They are investing all of their money in creating these initiatives and hope to turn a profit, not so they can buy new things, but so they can afford to run programs for children, or rehabilitate animals, or keep the majority of their property as pristine forest. I am impressed and amazed. The swamp in the property. The Spanish translation is not perfect! I did it by myself – but it accurately conveys what Herbert is saying. I’ll be fixing it soon with a translator. Last night we stayed at Magali’s again (Amazon Shelter) because a pipe broke at La Habana Rural Inn. We got up at 5:00am to visit the small bird clay lick near Magali’s house on the Tambopata River. It was spectacular! 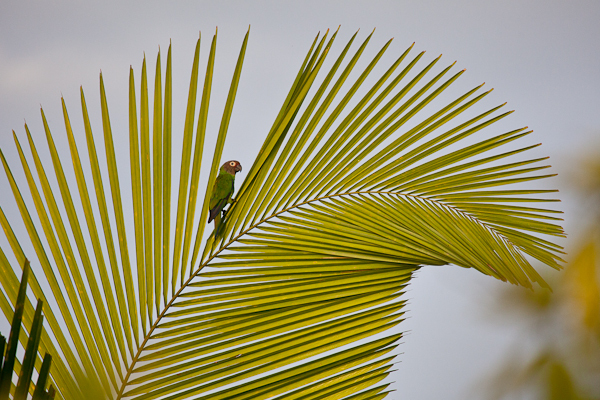 There were dusky parakeets and blue-headed parrots. I estimated that there were over 100 birds over the course of an hour. They arrived early and stayed in the trees above the clay lick for a little while before flying down to the riverbank. 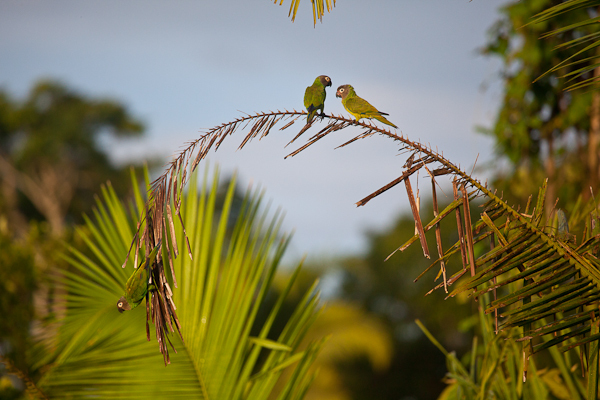 In our last moments at the clay lick, two yellow-fronted parrots arrived as well. Overall it was a morning well spent. I took a nap after our morning excursion and then we headed out to La Habana Rural Inn, a property owned by Professor Herbert Lovon and family. Herbert is a character. He is an older gentleman and was a science teacher for most of his life. Now, he owns a beautiful piece of property in the corridor and is creating a paradise. One of the first things he told me was “We don’t have any paintings in the buildings because you just need to look outside to see art.” He has a few rustic cabins on the property, a canopy tower on a terrace behind his house, and a beautiful botanical garden. 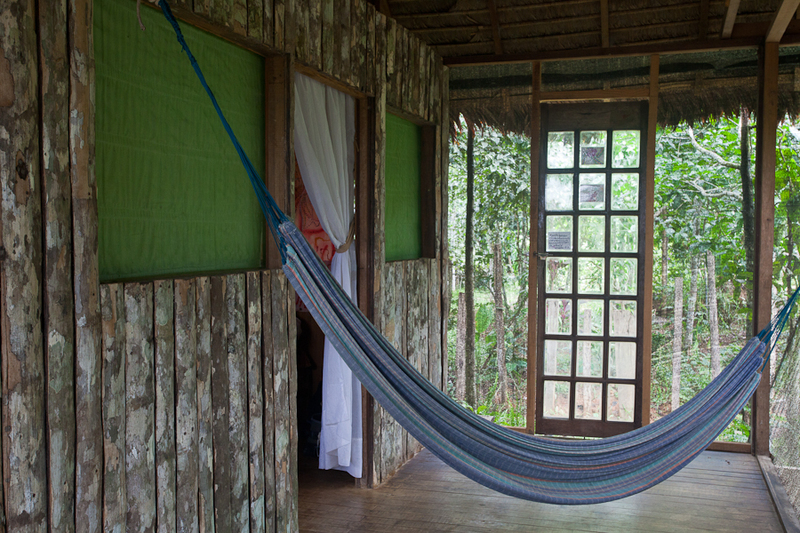 Besides all that he has a view of the Tambopata River and many hectares worth of forest and trails. He took us on a tour of the whole property. Along the way he teased me relentlessly in Spanish and told the funniest stories. One of my favorites was the story of the ironwood tree – one of the strongest woods in the forest. Apparently cutting down an ironwood tree with a stone axe used to be a test given by the fathers of young girls to eligible bachelors. If they couldn’t do it – they were lazy and unworthy. We were standing in front of one of the giants as he told the story and I could hardly imagine trying to cut down a tree so massive and strong. The men who did it must have really been committed (probably reduced the divorce rate). He also told me about the forest knome that they believe in here in the jungle. It often assumes the shape of an animal or a family member and leads people astray in the forest. It is the reason that people get lost in the forest – especially beautiful women. The knome can change everything about its shape except for its feet. It has one human foot and one knome feet – so Herbert warned me to always look at a person’s feet before I go into the forest with them. In our walk in the botanical garden, Herbert made sure to point out all the interesting plants. He stopped for a bit longer at one called para para. “This is for old men like me to make the ladies happy,” he told me. It took me a moment to understand him, but I got it when he bent a leaf in half and let the bent half slowly pop back up. His raised eyebrows said it all. Para para is the natural equivalent of Viagra. Overall it was a beautiful property and a great visit. I would enjoy spending more time there and would recommend it to anyone who wants to relax and see some pristine forest within 15 minutes of the city of Puerto Maldonado. We spent the afternoon at Playa Botafogo – a beach that is nonexistent in the rainy season. The property around the beach was beautiful though. 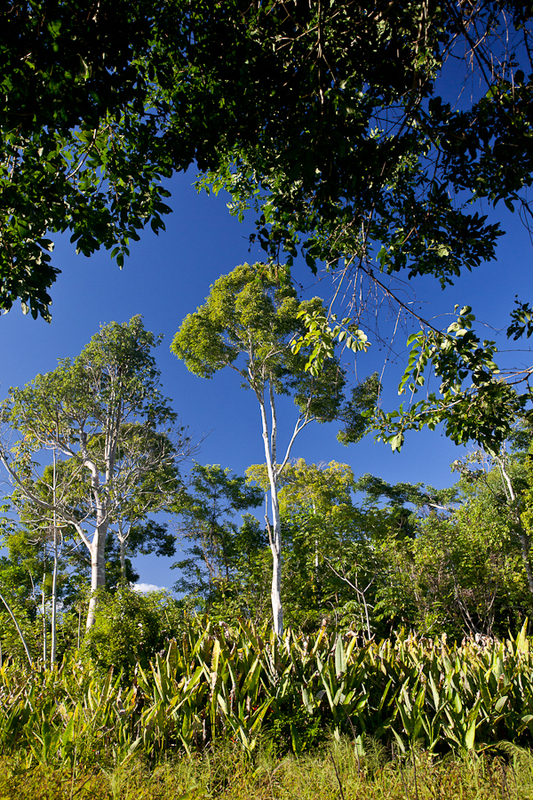 They have been reforesting much of the property and the forest is strong and healthy. We saw a lot of wildlife in the short walk we took on the trails. Ronald, the owner, is a young man and his two daughters were charming. He is passionate about conserving the forest and showed me the large trees on his property with incredible pride. It is amazing here to see men take as much pride in a large ceiba or ironwood tree as in an expensive sports car or a new house. We spent the night at Magali’s and had a lovely choclo salad (choclo is a delicious variety of corn from the highlands). I went to bed early to prepare for an early morning. 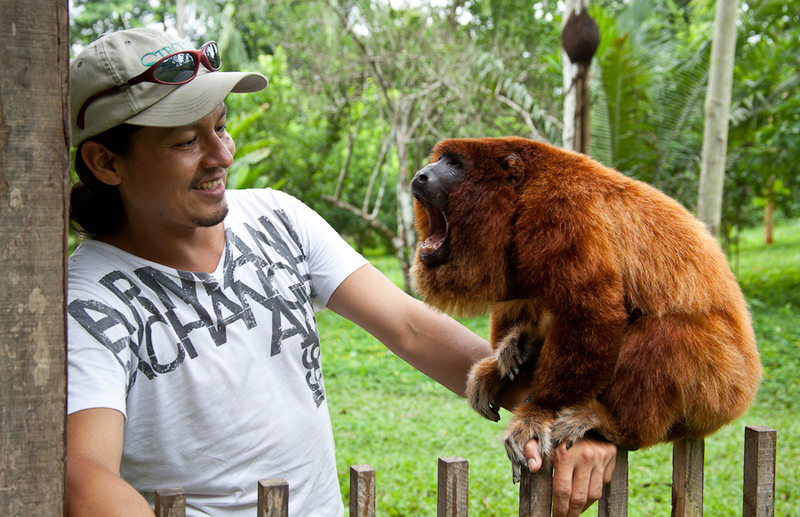 We arrived at Amazon Shelter this morning and were greeted by a red howler monkey named Pepe. He ran up to us much like a happy dog and led us to the lodge. Amazon Shelter is run by a woman named Magali – she has a rehabilitation center, a lodge, and a beautiful piece of forest. She moved to the Puerto Maldonado area from Lima about four years ago to start the shelter and now has over 20 animals to care for. 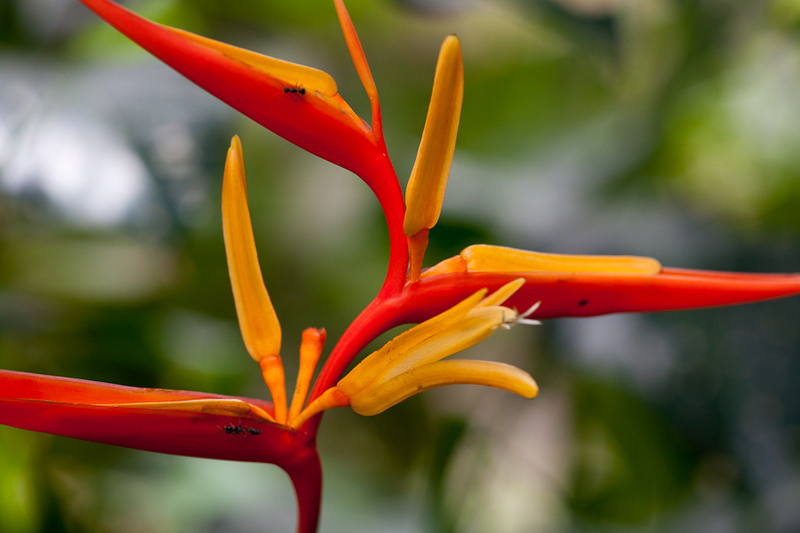 The animals range from a koati to macaws to a red brocket deer. And they could not ask for a more loving and caring guardian. Magali sat with us over a cup of coffee while rubbing the belly of Pepe the monkey. She would intermittently turn to Pepe and whisper sweet words. She talks to all of the animals like they understand her and it is incredibly endearing. She told us the history of the project and talked about the challenges and lessons learned. It takes a strong woman to take in a puma and learn how to care for it. We took a tour of the property with Thomas, one of her volunteers. He is from Australia and is working at Amazon Shelter for six days during his time in Madre de Dios. Magali has volunteers on an off, but her goal is to staff the shelter with 10 volunteers per month. It is a great opportunity to work with animals and to learn about the struggles of caring for a diverse bunch of wild creatures. Thomas seemed to be having a ball. While we were visiting Magali got news that she would receive a new Titi monkey. This leads to a flurry of activity. They have a special area called the “quarantine area” for new animals. Magali has visitors at the shelter and new animals aren’t adjusted to the movement of many people. 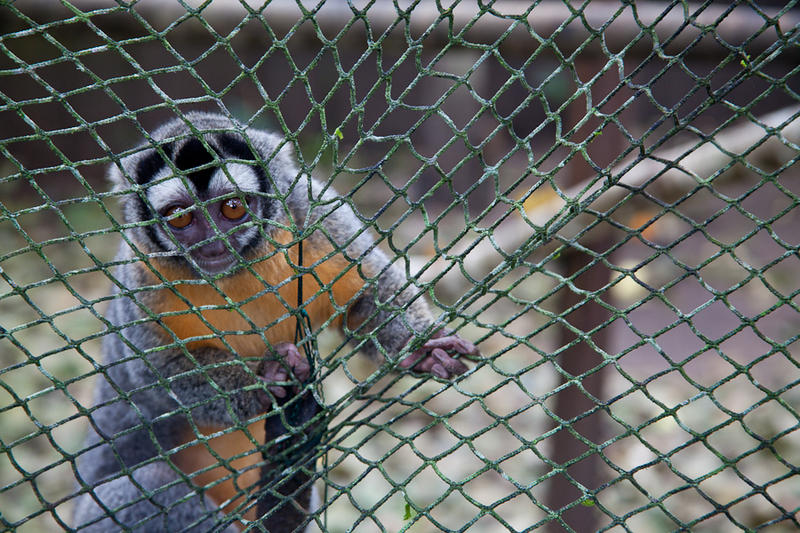 The monkey will have a new shelter in a quiet part of the forest. Each animal also has a very specific diet. The list is incredible – one boiled egg, three leaves of lettuce, one beet, half a papaya – and that is just for a single species. For Magali, it is a labor of love. I know this because she was tired today from having taken blankets to the monkeys in the night because it was cold. I spent a peaceful night in the lodge and enjoyed listening to the animals with a red howler monkey curled up in my lap as I lay in a hammock on the porch. We got up at 4:30am to meet the boat at Refugio Amazonas. Mr. Ramirez drove the peke-peke and we arrived at 6:00am, 30 minutes before the scheduled departure. The boatman at the dock informed us that the boat had already left for Puerto Maldonado. We ventured up to the lodge with heavy hearts and worried minds and quickly discovered that the boat had not left – it was leaving at 8am. We settled in and were given a hospitable welcome by the lodge manager. She let us eat breakfast at the lodge and Therany and I toured the facilities. It was luxurious. – a beautiful wooden lodge with lanterns and an open dining room that looks out into the forest. There is also a bar where they sell drinks and ice cream. The boat left at 8am and we piled in with all of the tourists. Therany and I ended up sitting beside a really nice family from Washington State. We talked about the road, gold mining, and the incredible beauty of Tambopata. We arrived at the community of Infierno a few hours later and were bussed back to Puerto Maldonado. From there, Therany and I picked up a car at the iSUR office and stopped by a bakery to buy a cake for the family we are visiting for Christmas. We arrived at Kapievi at lunchtime. It is a one-hectare property that used to be a pasture. The owner, a charming woman, has converted it into an ecovillage. There are eight cabins on the property and she has reforested it with native trees and plants – including orchids and fruit trees. 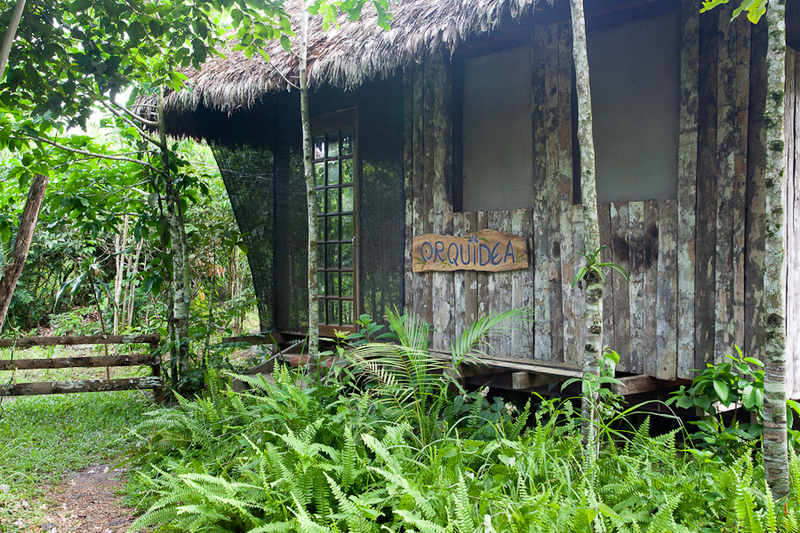 I am staying in the cabin called Orquidea. It has two hammocks on the screened porch and a bathroom that is open in the back. I can shower and look at the forest. We are here for three nights. The family is lovely. They are trying to grow all of their own fruits and vegetables and they are all vegetarians. They even have a yoga studio. We spent the afternoon touring the property and resting. The owner’s children are all visiting, so we are taking it easy. Dinner was a smaller meal of bread and fruits. Lunch is the biggest meal of the day here and people typically eat a small dinner of bread and cheese or some other aperitifs. I slept wonderfully last night and awoke to a breakfast and a tour of the property. We photographed the orquids, the yoga studio, and the buildings. At 10am, the family took us to a chocolatada, a hot chocolate party that the corridor association threw for the children of the local community. We spent the rest of the day taking pictures and visiting with Piernia’s family. 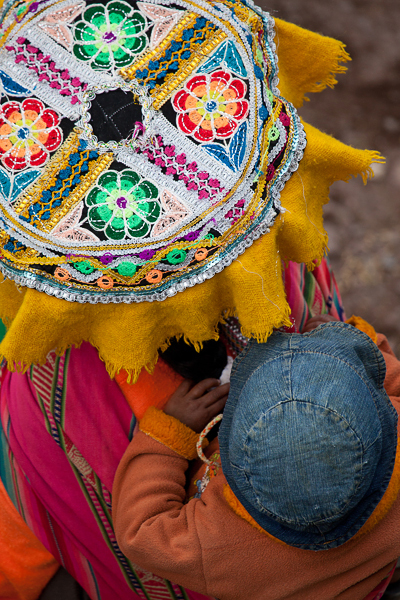 In Peru, they celebrate Christmas much like we celebrate New Year’s. They eat a very late dinner (11pm or so) and then welcome in Christmas at midnight with an astounding number of fireworks. We went to Piernia’s brother’s house for Christmas and had a lot of drinks and danced to cumbia music. We did not eat until almost 11:30pm and then everyone counted down to the arrival of Christmas. At midnight at a song played on the radio “La navidad llegue” – Christmas has arrived. Only at that point do they exchange gift. In a gesture of incredible kindness, Piernia had gotten gifts for both me and Therany. Therany got a really nice t-shirt and I got a belt that says “Kapievi” – the name of her initiative. I went to bed soon after midnight and overall spent a wonderful Christmas. It was so nice to be with a family instead of alone in a hotel.